Study: Therapy For Torture Victims Can Boost Their Income In Just A Few Years : Goats and Soda Danish researchers analyzed the cost of treating refugees who have been tortured — both physical and psychological — and the economic impact. 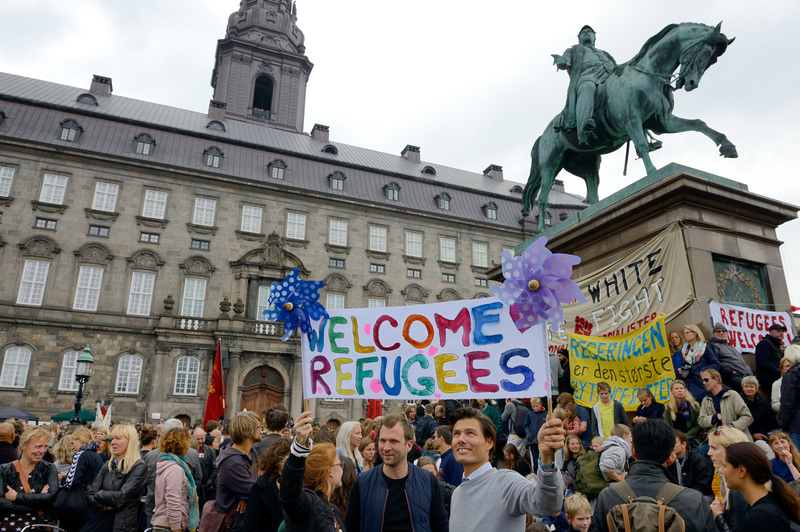 A demonstration in Copenhagen, Denmark, in support of Syrian migrants. A new study looks at the benefit of offering physical and psychological support to refugees who have been tortured. We already know the moral reasons for helping traumatized refugees to recover. But are there economic benefits as well? A study published in BMC Health Services Research on May 18 analyzes the costs of treating torture victims and the economic advantages of helping suffering refugees recover. Treating refugees who have been tortured "can be an economically viable strategy," the study concludes, especially when it comes to families. The researchers were surprised to learn that the families saw a significant difference in their income. "I was thinking that maybe it would take at least 10 years, or 15 years, or one generation, to reach that level," Shr-Jie Sharlenna Wang, senior researcher and epidemiologist at the Danish Institute Against Torture, tells NPR. "Those with a monopoly of power are carrying out torture to gain information and as a form of social control," says Line Bager, the lead author and a researcher at the Danish Institute Against Torture. In the study, she uses the United Nations definition of torture: "cruel, inhuman, degrading treatment perpetrated by any party." She also points out that torture can be psychological as well as physical. The researchers followed 44 patients at the Danish Institute Against Torture in Copenhagen between 2001 and 2004, comparing their results to another group of 44 refugees on the wait list who had not yet received treatment. In addition, researchers looked at economic trends between 2001 and 2014, tracking the participants' family income and the costs of later health care treatments. Therapy — especially the extensive measures used to treat severely traumatized refugees — can be expensive. The process often includes consultations with psychologists, neurologists, psychiatrists, rheumatologists, physiotherapists and others. In Denmark, health-care costs are covered by the government, but the researchers wanted to investigate whether these public-health resources were being used effectively. They averaged a cost of about $32,000 for each patient by adding together overhead expense and the salaries of specialists and dividing by the number of patients. The study indicates these costs are offset, however, by a better quality of life enjoyed by patients and their families — thus enabling them to join the workforce earlier and perform more successfully than families of tortured refugees who had not been treated. And these families brought in around $32,000 more over three years when you combine their increased income and lower health costs. But isn't this ... a little obvious? Not always, the researchers say. They began the project in 2014. at the height of the Syrian refugee crisis, but also used data compiled by the Danish institute since 2001, when there was a major influx of Afghan and Iraqi migrants. The dominant narrative then, as now, was that traumatized refugees were a burden on society. The researchers wanted to determine whether treating tortured refugees was indeed straining the Danish health system — and whether an investment in their wellness was ever repaid. They found that helping refugees who had been tortured can benefit not only individuals but society as a whole. "What they will contribute to the host country is amazingly bigger than what we expect," Wang says. Compared to the families of torture victims who had not yet received treatment, the families of those who had quickly earned much more money than expected. "Those families contribute a lot to society, paying taxes to society," Wang explains. "Our results show that within three years, we already see a net social benefit." She calls it a quick return on the government's investment. Looking at the families as a whole, rather than following an individual, is particularly important, the researchers say — especially given the lasting aftermath of post-traumatic stress disorder, which can also affect loved ones. In addition to the significant emotional burden of caring for a traumatized loved one, family members often assume more financial hardships. With treatment, however, some of these difficulties ease. Dr. Kim Griswold is an associate professor at the University at Buffalo and the medical director of the Center for Survivors of Torture in Buffalo, N.Y.
"There are many who doubt that refugees are capable of recovery and contribution; our current administration is a prime example," says Griswold, who is not affiliated with the Danish study. "The more well-designed research we can do will help to dispel myths." The value of hosting refugees is supported by hard data, says Griswold. "Rehab after torture often allows individuals to enter the workforce, contribute to local economies and incur less health care costs over time." The Danish researchers say this is the first-ever economic evaluation of treating tortured refugees, and they hope that policymakers and health practitioners will use their data and results to inform migration policies. "They will have a better future in the host country if we provide necessary support at the very beginning," Wang says.